Bapco Closures develop and manufacture a unique three part closure solution which incorporates a full foil easy open membrane. 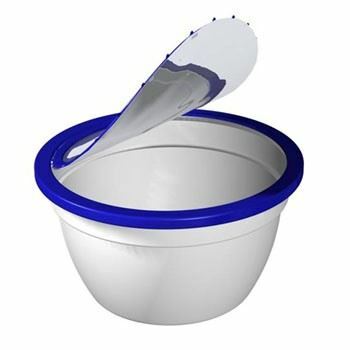 These closures, which are currently employed for blown and injection moulded containers, can be as easily applied to thermoformed containers of any shape and in particular the non-round solutions are liked for the potential to innovate further for ‘ready meal’ applications. Bapco Closures approached Leatherhead Food Research, Surrey, UK, which is an independent organisation delivering innovative research, scientific consultancy and regulatory guidance and interpretation in order to assess the suitability of the foiled closures for microwaving food in round and non-round containers. Bapco passed with ease all the key criteria including ensuring that the correct time and temperature combination was achieved to meet the required cooking instructions. The targets set for cooking using the Bapco Closures on a Thermoformed container related directly to the reheat schedule of the Department of Health cook chill guidelines and that the product must be of an acceptable sensory quality. Bapco Closures has continued to develop successful closure solutions over the past 10 years. To date it has over 194 patents across 35 countries worldwide. Its unique ability to be open-minded when it comes to shape continues to provide opportunities across the various business sectors. Bapco Closures, a leading designer and supplier of caps and closures for the food and drink industry, has launched an innovative new closure system into the UK market with G's Marketing and Marks & Spencer (M&S). Bapco Closures has launched its first closure in Australia with an 82mm twister created for SPC Ardmona, the country’s leading fruit processing company. The two part injection moulded closure has been applied to Goulburn Valley and SPC fruit products where it has hit shelves of major supermarkets Coles and Woolworths. The closure, with an integrated fused foil laminate, was a perfect fit for the company’s product design and brand development. Two revolutionary all-in-one foil closure solutions for the food industry have been launched through a licence agreement between Bapco Closures, founder of the pioneering BAP® technology and Aptar, a worldwide leader of innovative dispensing closure solutions. The new Sim-pull and Trilogy closures both feature proprietary Bonded Aluminium to Plastic (BAP®) Technology, a unique, all-in-one foil to closure solution. Manufacturer Relco has joined forces with Bapco Closures, a leading designer and supplier of closures for the food and drink industry, to unveil its latest indexing induction welding technology. The modular direct contact induction welding system has been exclusively designed and built for Bapco Closures for the application of its closures on a low to medium speed automatic line. Bapco Closures, a leading designer and supplier of closures for the food and drink industry, has signed a license agreement with Aptargroup, Inc. allowing the international company to manufacture, market and sell BAP® closure technology. With manufacturing facilities in North America, Europe, Asia and South America, Aptargroup, Inc. will help Bapco Closures increase the exposure of its innovative, patented technology. Several years after its success in North America, Bapco Closures has finally cracked the UK market, launching its innovative packaging in Marks and Spencer stores for the first time last month. Co-founder and Head of Operations, Peter McGeough, talks about the challenges of getting a technology business off its feet and introducing a revolutionary system to the sector. In this feature article, Peter McGeough, co-founder and Head of Operations at Bapco Closures, discusses the importance of innovative closure design. His contention that caps and closures receive less attention than containers is a valid one - read on to disover what implications this attitude has.